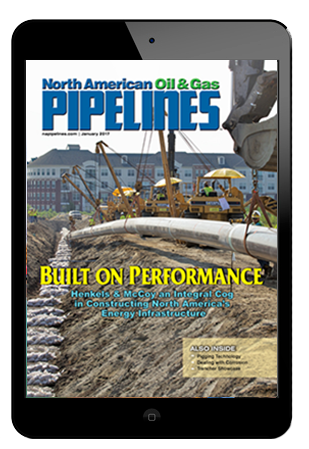 Apex Pipeline Services Inc. was awarded a contract by EQT Gathering to install and test approximately 16 miles of 20-in. pipeline in Wetzel and Doddridge counties, W.Va. Headquarters is Hastings, W.Va. The superintendent is Bob Keaton. Approximate start date: April 29. Midwest Underground Inc. was awarded a contract by Oneok to install a 6-in. compressor in Will County, Ill. Headquarters is unknown. The superintendent is Shaun Tippie. Approximate start date: April 24. Pennington. Approximate start date: April 23. Letourneau Products Mfg. Corp. was awarded a contract by Price Gregory International Inc. for clearing, grubbing and matting on approximately 14.8 miles of 24-in. pipeline right of way in Montgomery, Bath and Rowan counties, Ky. Headquarters is Morehead, Ky. The superintendent is Mark A. Letourneau. Approximate start date: April 22. Northern Clearing Inc. was awarded a contract by EQT Corp. to clear approximately 16 miles of 24-in. pipeline right of way in Wetzel and Doddridge counties, W.Va. Headquarters is unknown. The superintendent is Dennis Bergman. Approximate start date: April 22. R.L. Coolsaet Construction Co. was awarded a contract by Consumers Energy to install two 24-in. launchers and receivers in Oakland County, Mich. Headquarters is unknown. The superintendent is Bart Jeannette. Approximate start date: April 22. R.L. Coolsaet Construction Co. was awarded a contract by Consumers Energy to install one 20-in. launcher, remove and replace three mainline valves, install two mainline valves and 250 ft of 20-in. pipeline, remove and replace one 20-in. tee in Washtenaw and Livingston counties, Mich. Headquarters is Chelsea, Mich. The superintendent is Joe Elliott. Approximate start date: April 22. Sheehan Pipe Line Construction Co. was awarded a contract by Sunoco Pipeline LP to install 3.83 miles of 10-in. pipeline in Beaver County, Pa. Headquarters is Monaca, Pa. The superintendent is Gerald Hill. Approximate start date: April 22. Snelson Companies Inc. was awarded a contract by Pacific Gas and Electric to perform hydrostatic testing on 5 miles of 8-in. pipeline in Stanislaus County, Calif. Headquarters is unknown. The superintendent is Mark LaRue. Approximate start date: April 22. Utility Services Authority LLC was awarded a contract by Michels Corp. to install approximately 2,400 ft of 30-in. pipeline via directional drilling in Bradford County, Pa. Headquarters is unknown. The superintendent is Erv Yoder. Approximate start date: unknown (announced April 22). Indianhead Pipeline Services LLC was awarded a contract by Price Gregory International Inc. to spray foam breakers and pillows for 6 miles of 8 and 16-in. pipelines in Lycoming County, Pa. Headquarters is Cogan Station, Pa. The superintendent is Mike McGill. Approximate start date: April 20. Henkels McCoy Inc. was awarded a contract by Buckeye to perform anomaly digs on 8- and 10-in. pipelines in Lancaster and Dauphin counties, Pa. Headquarters is unknown. The superintendent is James Baron. Approximate start date: April 18. Laney Directional Drilling Co. was awarded a contract by Energy Services South to install approximately 2.03 miles of 24-in. pipeline via directional drilling in Jackson County, Miss. Headquarters is on the jobsite. The superintendent is Steve Dodd. Approximate start date: April 18. Dun Transportation & Stringing Inc. was awarded a contract by Stupp Corp. to offload and stockpile 15 miles of 30-in. pipe in Bell County, Texas. Headquarters is the pipe yard. The superintendent is Johnny Denton. Approximate start date: April 16. Foltz Welding Ltd. (d/b/a Continental Pipeline Services) was awarded a contract by Southern Star Pipeline Co. to install a 4-in. meter station in Osage County, Kan. Headquarters is unknown. The superintendent is Billy D. Grimes. Approximate start date: April 15. Laney Directional Drilling Co. was awarded a contract by Conestoga-Rover & Assoc-Wolverine Pipeline Project to install 1,19 I ft of 8-in. pipeline via directional drilling in Ottawa County, Mich. Headquarters is on the jobsite. The superintendent is James Bond. Approximate start date: April 15. Laney Directional Drilling Co. was awarded a contract by ExxonMobil-Red River Pipeline Replacement Project to install 3,291 ft of 20-in. pipeline via directional drilling in Little River County, Ark., and Bowie County, Texas. Headquarters is on the jobsite. The superintendent is David Sewell. Approximate start date: April 15. Laney Directional Drilling Co. was awarded a contract by Williams-Palmerton Loop project to install 1,423 ft of 42-in. pipeline via directional drilling in Monroe County, Pa. Headquarters is on the jobsite. The superintendent is Shelton “Bubba” Carlisle. Approximate start date: April 15. Minnesota Limited LLC was awarded a contract by Centerpoint Energy-Minnegasco to replace approximately 1.6 miles of 20-in. pipeline in Hennepin County, Minn. Headquarters is Big Lake, Minn. The superintendent is Ron Piescher. Approximate start date: April 15. Pe Ben USA Inc. was awarded a contract by Rockford Corp. to string approximately 118 miles of 20-in. pipe from Muskingum to Clinton counties, Ohio. Headquarters is Circleville, Ohio. The superintendent is Jimmy Gregory. Approximate start date: April 15. Pedero Pipe Support Systems USA was awarded a contract by Michels Corp. to spray foam breakers and pillows for 9 miles of 16-in. pipeline in Richie County, W.Va. Headquarters is Pennsboro, W.Va. The superintendent is Brian Smith. Approximate start date: April 15. Right-of-Way Clearing & Maintenance Inc. was awarded a contract by Otis Eastern Service Inc. to clear approximately 1.21 miles of 8-in. pipeline right of way in Westmoreland County, Pa. Headquarters is unknown. The superintendent is Neil E. Kinneer. Approximate start date: in mid-April (announced April 15). Welded Construction LP was awarded a contract by Blue Racer Midstream LLC to install 12.2 miles of 16-in. pipeline in Tuscarawas and Harrison counties, Ohio. Headquarters is Cadiz, Ohio. The superintendent is Rob Seebeck. Approximate start date: April15. Welded Construction LP was awarded a contract by Williams Gas Pipe Line – TRANSCO to install approximately 2.2 miles of 42-in. pipeline in Lycoming County, Pa. Headquarters is Hughesville, Pa. The superintendent is Gary Gavlock. Approximate start date: April 15. U.S. Pipeline Inc. was awarded a contract by Williams Northwest Pipeline to perform hydrostatic testing on 6.12 miles of 26-in. pipeline in three segments in Grand County, Utah, and Montezuma and La Plata counties, Colo. Headquarters is Moab, Utah. The superintendent is Dana Bratcher. Approximate start date: April 15. InterCon Construction Inc. was awarded a contract by Antero Resources/Blueflame Pipeline to install 4,400 ft of 20-in. pipeline and 2,200 ft of 16-in. pipeline via three directional drills in Doddridge County, W.Va. Headquarters is unknown. The superintendent is Joe Schmelzer. Approximate start date: April 11. Snelson Companies Inc. was awarded a contract by TransCanada to install approximately 1,600 ft of 24-in. pipeline via directional drilling in Nodaway and Holt counties, Mo. Headquarters is unknown. The superintendent is Rick Melroy. Approximate start date: April 10. Apex Pipeline Services Inc. was awarded a contract by Eureka Hunter to install and test approximately 2 miles of 20-in. pipeline in Monroe County, Ohio. Headquarters is near Sardis, Ohio. The superintendent is Cecil Hill. Approximate start date: April 8. Dun Transportation & Stringing Inc. was awarded a contract by Enbridge to offload and stockpile various diameters of pipe in Douglas County, Wis. Headquarters is the pipe yard. The superintendent is Mike Bruce. Approximate start date: April 8. Northern Clearing Inc. was awarded a contract by Michels Corp. to clear approximately 21 miles of 30-in. pipeline right of way in Bradford, Wayne and Pike counties, Pa. Headquarters is unknown. The superintendent is Rod Grubisic. Approximate start date: unknown (announced April 8). Pipeline Energy Group Inc. (d/b/a Carl Smith Pipeline) was awarded a contract by Antero Resources to install approximately 16.87 miles of 24-in. pipeline in Doddridge County, W.Va. Headquarters is West Union, W.Va. The superintendent is Eddie Smith. Approximate start date: April 8. Pipeline Energy Group Inc. (d/b/a Carl Smith Pipeline) was awarded a contract by Crestwood Midstream to install 12.5 miles of 20-in. pipeline in Doddridge County, W.Va. Headquarters is West Union, W.Va. The superintendent is Eddie Smith. Approximate start date: April 8. R.L. Coolsaet Construction Co. was awarded a contract by Sun Pipeline Co. to fabricate and install one 12-in. launcher and metering facility in St. Clair County, Mich., and one 12-in. launcher, metering facility and crossover piping in Monroe County, Mich. All fabrication work is to be done in Wayne County, Mich. Headquarters is Romulus, Mich., for fabrication and unknown for the installation. The superintendents are Butch Johnson, Randy Recker and Bart Jeannette. Approximate start date: April 8. Snelson Companies Inc. was awarded a contract by Pacific Gas and Electric to remove and replace a 24-in. valve on a meter run, to hydrotest 2 miles of 16-in. pipeline and a valve set and to install 2 miles of 24-in. pipeline in Fresno County, Calif. Headquarters is unknown. The superintendents are David Wix and Lou McMullen. Approximate start dates: April 2 and April 8. Northern Clearing Inc. was awarded a contract by Sheehan Pipe Line Construction Co. for clearing of approximately 14 miles of 20-in. pipeline right of way in Davidson County, Tenn. Headquarters is unknown. The superintendent is Duanne Kmieciak. Approximate start date: April 6. Midwest Underground Inc. was awarded contracts by Northern Natural for the following: 1) install a 10-in. launcher in Boone County, Iowa. Headquarters is unknown. The superintendent is Mark Weber. And 2) to install approximately 131 ft of 4- and 8-in. pipeline in Wright and Martin counties, Minn. Headquarters is unknown. The superintendent is Ken Leslein. Approximate start dates: 1) April 3 and 2) March 25. Gabe’s Construction Co. Inc. was awarded a contract by Linde Corp. to install approximately 1,250 ft of 10-in. pipeline via directional drilling in Bradford County, Pa. Headquarters is on the jobsite. The superintendent is Steve Huibregtse. Approximate start date: April 2. Letourneau Products Mfg. Corp. was awarded a contract by Welded Construction LP for clearing, grubbing and matting on approximately 5.34 miles of 6-, 8- and 12-in. pipeline right of way in Bradford County, Pa. Headquarters is Wysox, Pa. The superintendent is Mark A. Letourneau. Approximate start date: April 1. ProFoam LLC was awarded a contract by Otis Eastern Service Inc. to spray polyurethane foam trench breakers and pipe pads for 10 miles of 10-in. pipeline in Beaver County, Pa. Headquarters is McDonald, Pa. The superintendent is Stuart Teague. Approximate start date: April 1. Sheehan Pipe Line Construction Co. was awarded a contract by Piedmont Natural Gas Co. to install 13.5 miles of 20-in. pipeline and 1.5 miles of 12-in. pipeline in Davidson County, Tenn. Headquarters is Antioch, Tenn. The superintendent is Gary “Cotton” Jordan. Approximate start date: unknown (announced April 1). T.G. Mercer Consulting Services Inc. was awarded a contract by Stupp Corp. to offload and rack 250 miles of 20-in. pipe in Saline, Butler and Cowley counties, Kan., and Payne and Lincoln counties, Okla. Headquarters is unknown. The superintendents are Bruce Munro and Barry Bleeker. Approximate start date: April 1. Welded Construction LP was awarded a contract by Access Midstream Partners LP to install 1.91 miles of 12-in. pipeline, 2.95 miles of 8-in. pipeline and 2,140 ft of 6-in. pipeline in Bradford County, Pa. Headquarters is unknown. The superintendent is Joe Carter. Approximate start date: March 28. Pedero Pipe Support Systems USA was awarded a contract by Price Gregory International Inc. to spray foam breakers and pillows for 17 miles of 10-in. pipeline in Washington County, Pa. Headquarters is Burgettstown, Pa. The superintendent is Eric Pickett. Approximate start date: March 27.